Sports journalist. 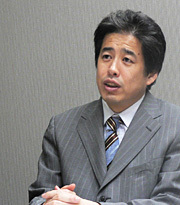 Director of Sports Communications Ltd.
Mr. Ninomiya was born in Ehime prefecture in 1960. After having worked as a journalist for sports and distribution magazines Mr. Ninomiya now works independently as a free journalist. His wide and expanding activities within Japan as well as abroad include coverage of the Olympic Games, World Soccer Championships, Major League Baseball and Boxing World Championship fights. Besides his activities as a sports journalist, Mr. Ninomiya also works on setting up sports clubs aimed at ‘regions’ and their ‘inhabitants’. Mr. Ninomiya is widely active as commentator for sports news programs and other news programs on TV. He is also regularly invited as lecturer.